Oh, hey there! It took two only nights to see one of my favorite situations. 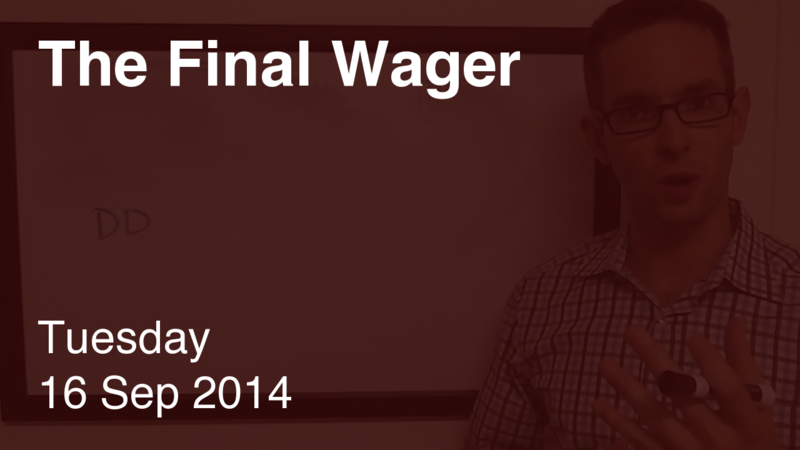 It’s The Penultimate Wager! And it doesn’t mean all that much – Bill has the game locked up. Elizabeth has the ball in her court. Priority #1 should be taking the lead. Elizabeth should wager at least 401* to do so. Elizabeth might feel good about this clue, however. In this case, she’d want to get at or above the 2/3 break point. 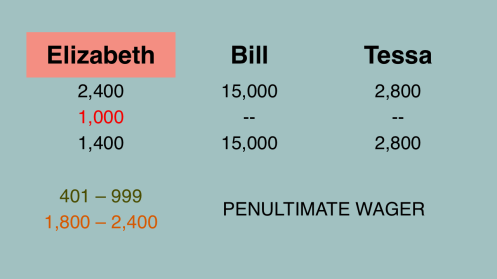 If she has 4,200, she can wager 1,400 to cover Tessa; if she’s wrong, she’ll have 2,800, Tessa’s total, and win if Tessa either misses Final or wagers zero. I wonder if Elizabeth had forgotten about the tiebreaker rules? This would have been a fine wager had she been gunning for first. *OK, I know some smarty is going to ask what happens if two players are tied heading into Final and end up tied for second. I believe whoever last had the lead then takes the second-place prize, so wagering 400 would place Elizabeth at a disadvantage. London is not 200 miles from Brussels. More like 60, unless you’re going by road or rail distance.